The primary fuel filters is the window to a fuel tank’s interior; if it is clogging quickly and repeatedly, it can only mean one thing, the tank is contaminated. As I strolled around a major boat show recently, I tallied the number of fuel additives I encountered. I stopped at 22, a number that makes a boat owner’s confusion on the subject more than understandable. At another boat show, I saw a sign at an engine dealer’s booth that essentially said, “Unless you use this additive with ULSD [ultra-Low Sulfur Diesel] fuel your engine will be damaged and your warranty will be voided.” (This was shortly after the ultra-low sulfur diesel monster reared its head.) Be cautious of any additive manufacturer making such ominous claims. It doesn’t take a rocket scientist to know that this dealer was selling fuel additives made by the engine manufacturer. In most cases if any engine or other manufacturer insists you use only their branded product to retain warranty coverage then they are obligated to provide it to you, for free. The law that governs this is the “tie-in sales provision” in the Moss Magnuson Act. An engine manufacturer can legally require that you use fuel that meets a certain standard, such as ASTM D-975, which covers among other things a fuel’s lubricity or slipperiness. 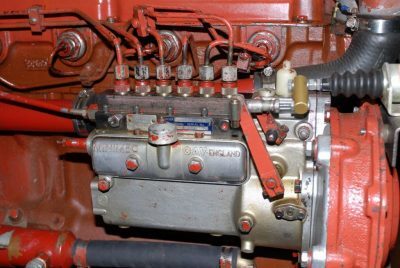 However, it’s also worth noting that fuel-related engine failures are nearly always excluded from engine manufacturers’ warranty coverage, which places a greater onus on the vessel operator to use high quality, on spec, clean diesel fuel. It’s worth noting, in some cases, engine manufacturer lubricity requirements exceed what’s available from refiners, at least in North America. For larger vessels, with significant fuel capacity, it makes sense to purchase additives in bulk. However, make certain the need exists and the potential benefits can be demonstrated before suggesting a customer go down the additive path. In short, don’t use additives unless they are specifically needed. The most common reasons for using additives are water “removal” and biological remediation. If there’s water in the tank it should, ideally, be drained or drawn out rather than treated chemically. If water isn’t present, then biological growth cannot exist. (Typically growth is bacteria, not algae, which is a plant and requires sunlight to survive. There’s not much sunlight in the average fuel tank.) Treating the illness rather than the symptom is always the preferred approach. Before considering any additive, consult the engine and generator manufacturer’s guidelines for the additive being contemplated. Different engine manufacturers necessarily have different recommendations. Caterpillar’s guidelines, for instance, generally discourage additives in diesel fuel; however, they approve of cetane improvers and biocides where necessary (if the cetane is lower than 40 or if biological growth is an issue). Diesel fuel injection systems rely on the fuel’s inherent lubricity, minimizing friction between moving parts whose clearance is sometimes measured in ten thousandths of an inch. One of the more valid uses for an additive is to enhance sub-standard or marginal fuel lubricity. As you can see, the path is anything but clear; however, most engine manufacturers are in the business of ensuring their engines work well and last a long time. It’s in their best interest to give users appropriate guidance on the subject of additives, and you should pass this information on to your customers as well. As there are a variety of products to choose from, it’s important to understand your customers’ additive needs before making a recommendation. Some additives encompass a variety of functions while others more narrowly target an issue. The most frequent issue is water. Water in fuel can lead to a host of problems, from corrosion and reduced lubricity to formation of biological colonies and their fibrous and acidic byproducts. The problem has become more acute with the introduction of ULSD and biodiesel. Clearly, water contamination deserves a vessel operator’s highest attention. Water is by far the most common contaminant in diesel fuel. While it’s bad enough on its own, it can indirectly wreak havoc by supporting extremely destructive bio-colonies that clog filters and lead to tank corrosion. Additives that deal with water fall into two categories: The first type are called “emulsifiers,” which encourage water’s mixture with or suspension in fuel so it can be passed on to the engine and vaporized in the combustion process. There are variations on how and if these additives will actually pick up free water from the tank bottom or simply suspend existing water in the fuel column. Some say they are “water neutral,” meaning they will not cause water to drop from suspension (or prevent it from doing so) and they will not encourage emulsification of water on the tank bottom. Consider as well that water that is in suspension, when trapped in fuel injection plumbing at rest, may fall out of suspension, where it can then accumulate and cause corrosion and lubrication problems. 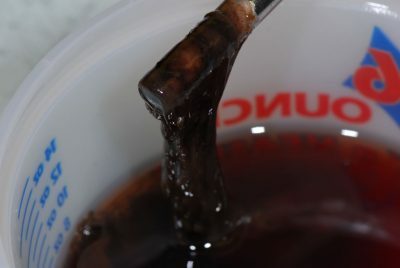 Some additive suppliers are careful to point out that their product will not remove free water from the tank bottom (often by design), an important distinction for the user who may believe he or she is remediating a water issue when in fact the product is only preventing water from falling out of suspension. 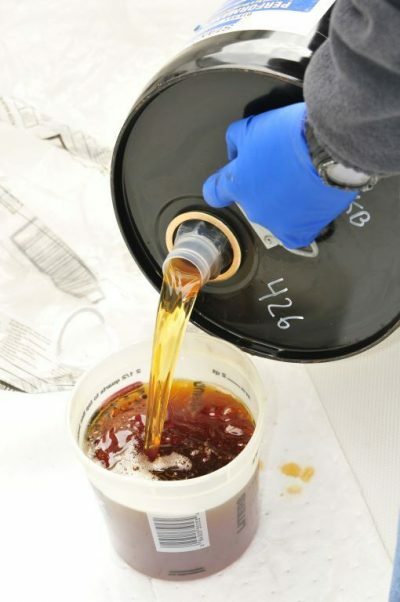 Emulsifiers, dispersants, and other similar constituents may allow the water to either be caught by the water separating filter (tough to do when it’s thoroughly emulsified) and drained off, or sent on to the fuel injection system and combustion chamber. Water is a poor lubricant and it doesn’t burn so the latter option is not ideal for the injection system. 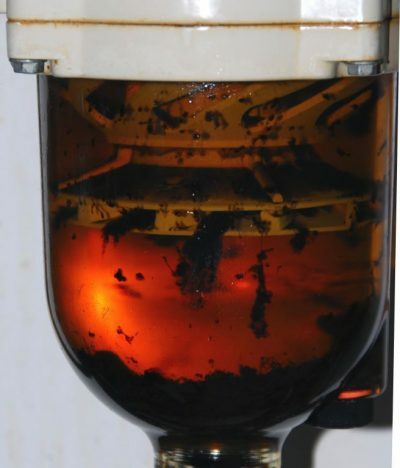 Additive manufacturers point out that this is desirable when compared to water remaining in the tank, where it often leads to much more serious biological fouling and corrosion. Demulsifiers encourage water to precipitate or drop out of suspension. A tank well is an ideal means of capturing and draining water, or drawing water via a stripper tube. 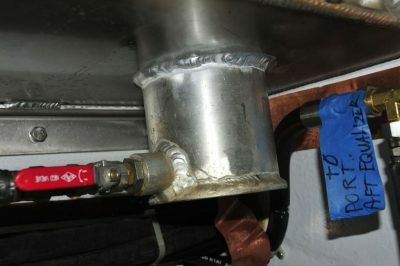 If a vessel’s fuel tank is equipped with a drain, stripper tube, or polishing system, then one may opt for the second type of additive that deals with water, which are called “demulsifiers.” These encourage water’s separation from fuel, so it can later be drained or pumped from a tank or filter. In considering this option, it’s critical that the stripper/drain or polishing system be installed in such a way as to ensure it will draw fuel/water from the absolute lowest portion of the tank, ideally from a well where water will accumulate. If not, water may still pool, leading to biological growth and corrosion for metallic tanks. Depending upon the location of the tank’s primary fuel pick-up tube, in relation to the bottom of the tank (is it at the lowest location? ), high quality conventional water separating fuel filters may be able to remove water that accumulates in tank bottoms, provided the vessel is used regularly. One of the dangers in using additives to treat water is not knowing how much water, if any, is in the tank. Without knowing this it’s difficult to know how much additive is needed and when it should be used. If a vessel’s deck fill is horizontal and directly over the tank, you can use a product called Water Finder. This paste-like material is smeared on the end of a dowel and dipped to the tank bottom. If water is present at that location in the tank, the paste will turn into a different color. (The color depends on the manufacturer. My preference, manufactured by Universal Water Finder changes the color from green to red.) The depth of the color change, i.e. how high up the dowel the paste turns red, indicates the depth of the accumulated water. This information gives some indication of the presence of water and the need to treat or remove it, preferably the latter. In Part 2, I’ll look at additives that enhance running characteristics as well as those affecting lubricity and performance.